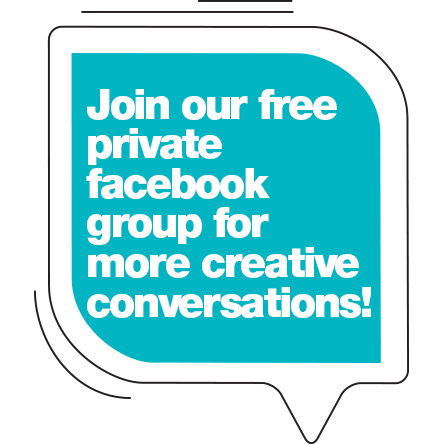 There was a really interesting conversation in our private Facebook group a while back, and I thought it was so important, it deserved a whole blog post (and some printable quotes for you to hang in your kids' creative space). The discussion started when a mom shared a story about her son not wanting to paint anything after she introduced him to Van Gogh's sunflowers and invited him to create some of his own art. She had a long discussion with him about how nobody else painted like Van Gogh, and how his paintings weren't admired or popular during his life, but that didn't stop him from painting. This was exactly what her son needed to hear, because right away he picked up his paintbrush and yellow paint and painted page after page completely yellow. Next he carefully folded the pages to make an amazing piece of art! When kids feel frozen because they want their work to be perfect, art can be an amazing way for them to shift gears and create something with no expectations attached. In math, your answer is either right or wrong. In science... it's the same way. Literature is a little more flexible, because writing is subjective, but there are still punctuation, grammar, and spelling "rules" to think about. When art is open-ended kids can't go wrong. They don't need to worry about rules. And, they are free to explore. Let's talk for a minute about what open-ended art is (and what it is not). We've just studied The Starry Night. Create some night sky art. (Kids then choose if they will cut paper and make a collage, paint something, use pastels so they can smudge them together, or draw a constellation with colored pencils.) I don't suggest anything beyond a topic, and kids choose their medium, style, and concept. We've just studied Georgia O'Keeffe and I invite them to make some flower art. They choose the flower, they choose the colors, they choose the medium. Once child decides to paint and the other asks to learn how to make a tissue paper flower. "Ok, let's figure out how to do that..."
In it "true" form, open ended art wouldn't even have a prompt. It would just be kids making any kind of art they choose. But when we're studying someone or something specific, and it's time to create our own art, I think it's okay to offer a vague art prompt that they can interpret in their own way (or even ignore all together). If your kids are used to thinking technically... if they tend to be scientific, or think of things as being right or wrong... art can be incredibly liberating for them! There's no fear of failure because there is no right or wrong! Since there is no right or wrong, it can never be perfect. All of this is not to say that we should never teach kids the fundamentals of design, or technique, or any of the other "rules" of art... eventually. At first, let it be fun, let it be light, and let it be open-ended. When kids express an interest in going deeper, by all means, help them to go deeper. If you have kids who put a lot of pressure on themselves to be perfect, invite them to create some open ended art, and see what happens. You can emphasize that with this kind of art it's the process of making art that's the most important thing, not the end result. After exploring art in this way, they'll probably return to their other projects with a new perspective. They might be more willing to experiment, take a risk, and solve a problem in a more creative way. Make sure to join us in the Facebook group to chat more. And, sign up to be an Art History Kids insider to get access to our Learning Library! It's full of fun projects, activities, and games... AND a free printable of artist's quotes that goes perfectly with our perfectionist kids discussion!